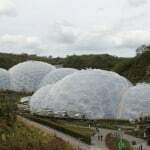 Today I took yet another day off from walking The South West Coast Path this time not for bad weather but to visit The Eden Project, a place I’ve been wanting to visit since it’s opening in 2001. I used public transport on the way there so I could enter for £12.50 🙂 However, there is only an hourly bus service from St Austell so prepare for a wait. My first impression on entering the site was how small the domes were, a deception because once inside they are truly vast! I guess the site itself is quite big and the domes are below the general ground level, being built in an old kaolinite pit. It’s very impressive but a lot quieter than the real jungle, perhaps a view jungly noises could be added. Or have a few parrots & monkeys hidden away. 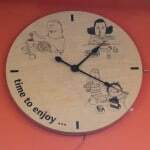 It would make a great day out with the grand kids it’s a pity it’s such a long way from Cambridge. Maybe we can get one built in the old quarry at Barrington or the lime pits at Cherry Hinton. I know, pigs might fly as well. 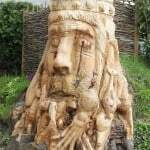 I decided to walk the 3 or so miles back to Charlestown, it only took 1 hour, the same as waiting for the bus and quite a pleasurable walk too especially seeing this remarkable wood carving of Neptune Sea God carved by Peter Martin in 2011 on the stump of a felled tree. Allthe days pictures are here.